The new Mac Pro does the right thing and abandons internal hard drives in favor of high-speed PCIe based storage. You could argue wanting more internal PCIe storage, but hard drives don’t belong inside this machine - for that there’s Thunderbolt 2. There’s a single proprietary Apple PCIe SSD connector and module inside the new Mac Pro. The connector looks similar to what’s in the new MacBook Pro but I haven’t verified compatibility. Unlike the new MacBook Pros, the Mac Pro SSDs only ship in a x4 PCIe configuration. The result is faster peak sequential speeds. My review sample had a 512GB Samsung XP941 based drive. I believe this is a 2-bit-per-cell MLC design with a 512MB LPDDR2-1066 DRAM. Samsung’s SSD architectures have evolved pretty well over the years. As long as you’re careful not to completely fill the drive you should be ok from an IO consistency standpoint as well. I continue to recommend keeping around 15 - 20% of the SSD free if you want to keep performance at a relatively high level. Definitely keep this in mind if you’re torn about what capacity drive you should outfit your system with. Apple offers three SSD capacities with the new Mac Pro: 256GB, 512GB and 1TB. Both default configurations come with a 256GB drive. Upgrades to 512GB/1TB cost the same regardless of your starting point: $300 and $800, respectively. Chances are you’re going to depend fairly heavily on external storage for media, which leaves you the flexibility of sticking with the base 256GB configuration. Personally I’d use the Mac Pro just as much as a regular PC (including gaming) as I would for photo/video work, so I’d push for the highest capacity SSD possible. Since Apple isn’t using a standard connector or form factor here, you can’t necessarily count on anyone offering a decent aftermarket solutions (although OWC has done so in the past). If OWC or anyone else was brave enough to produce an aftermarket Mac Pro SSD, it might come with fewer tradeoffs compared to what we’ve seen in the portable Mac space. I’m primarily talking about ultra low idle power not being as much of an issue for an SSD in the Mac Pro. 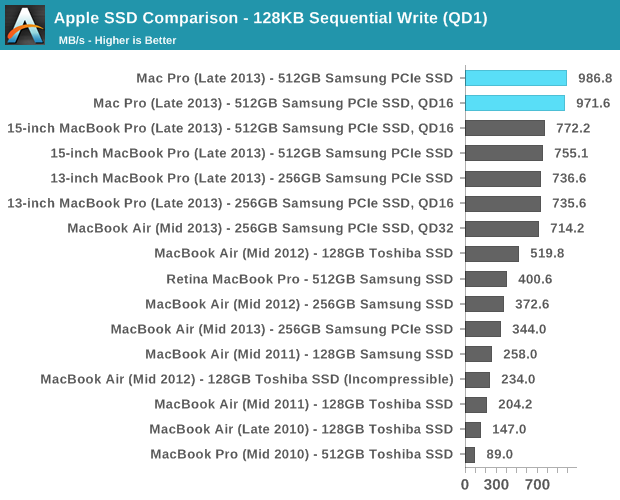 Last time I looked, OWC’s aftermarket MacBook Air/Pro SSDs consumed more power at idle compared to the Apple OEM drives. The same issues wouldn’t matter in a Mac Pro. 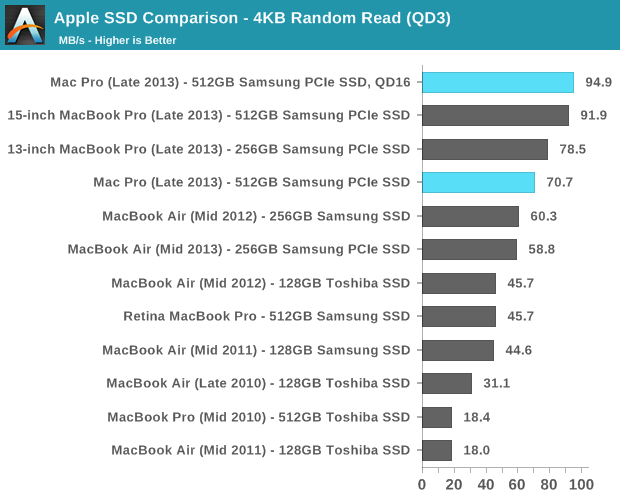 I ran the 512GB SSD through our standard four-corners Iometer test suite. 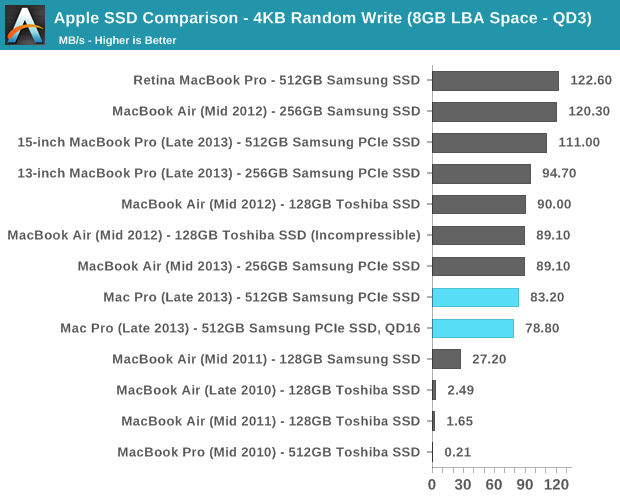 The numbers were expectedly a bit higher than what I measured on the 15-inch Haswell rMBP and the 21.5-inch Haswell iMac thanks to the drive’s PCIe x4 interface. Random write performance takes a step backwards but all of the results we're showing here are more than enough for single user workstation use. Although Mavericks itself seems to have issues that can cause high latency IO (particularly around quicklook), the SSD in the Mac Pro performed quite well. 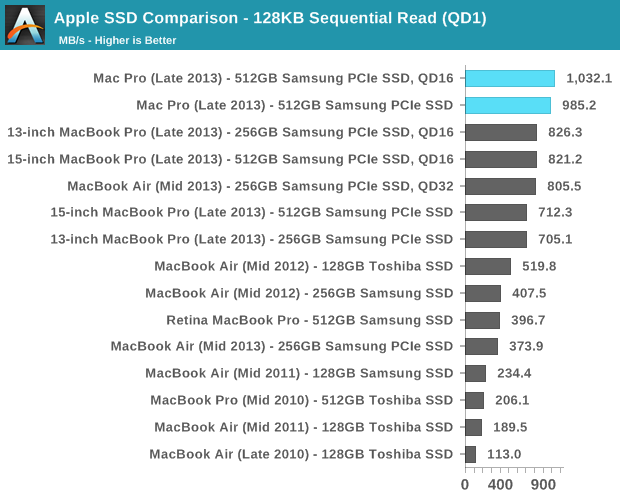 I’m beyond pleased to see that Apple has moved its Mac lineup virtually top to bottom to PCIe SSDs. This is absolutely the right approach, and one that all other OEMs should follow. Broadcom won all of the networking sockets in the new Mac Pro. Each machine ships with two BCM57762 Gigabit Ethernet controllers and a BCM4360 802.11ac controller. Each controller is connected to its own PCIe 2.0 x1 lane, guaranteeing it more than enough bandwidth to operate at full speed. 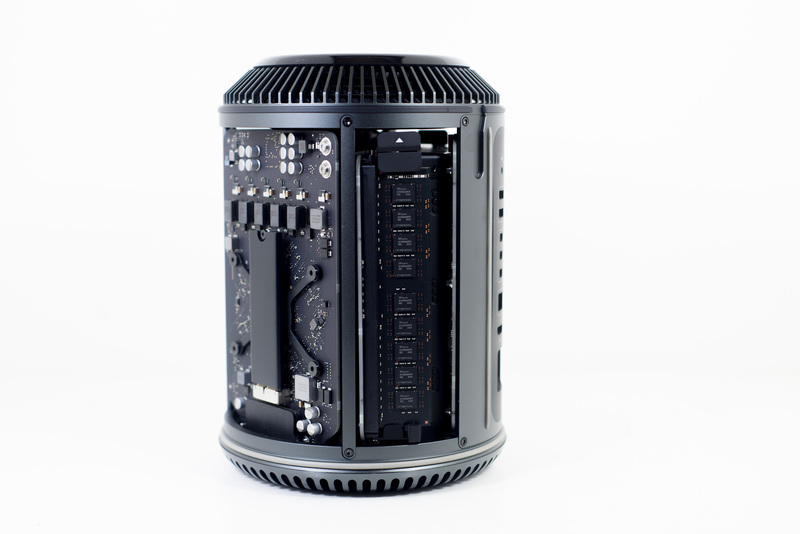 The GigE ports on the back of the Mac Pro are thus independent and can sustain full bandwidth in tandem. 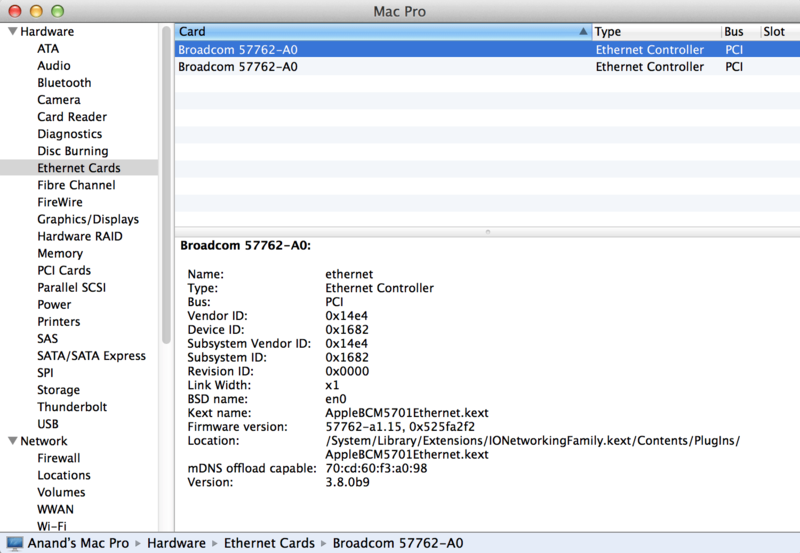 The 802.11ac solution is the same 3-stream BCM4360 you’ll find in the new Haswell MacBook Pros. The Broadcom controller supports 80MHz wide channels and 256 QAM, resulting in a peak theoretical data rate of 433Mbps per stream. With three streams that works out to be a max negotiated PHY rate of 1.3Gbps. 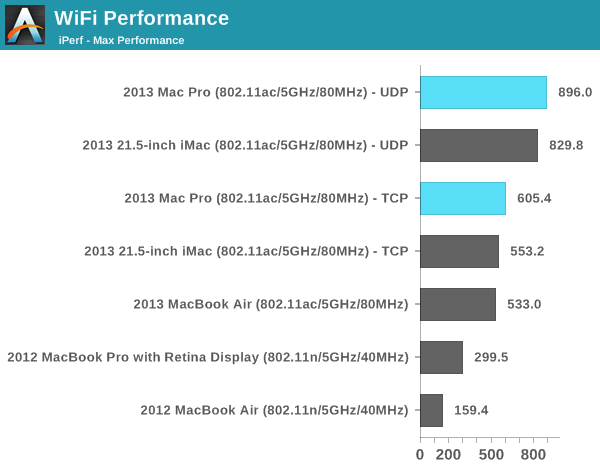 In practice I found the Mac Pro’s WiFi performance in best conditions to be similar to that of the 21.5-inch 2013 iMac, which ships with the same hardware. 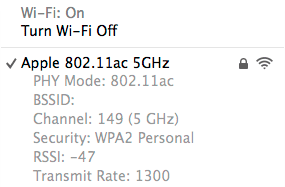 Over UDP that amounts to just under 900Mbps, and a bit over 600Mbps over TCP. You’re still better off using GigE if you can, but 3-stream 802.11ac is arguably good enough if you can’t get a cable down to your Mac.